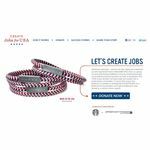 Starbuck's Create Jobs for USA Program: Great Initiative or Great Marketing? Are Mobile Websites Enough to Improve SEO Rankings? Buy a Cup of Joe at Starbucks and You Too Can Lower Unemployment! Is This for Real? 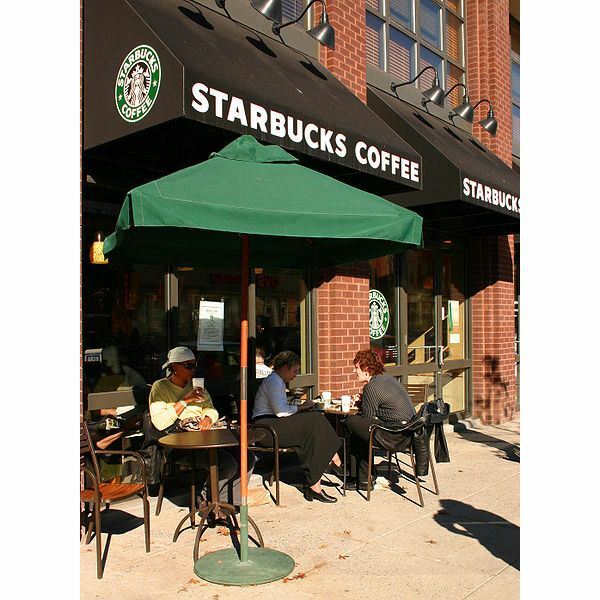 On November 1, 2011, coffee giant Starbucks partnered with the Opportunity Finance Network initiating the “Create Jobs for USA Program." The idea looks good—on paper and donated dollars are pledged to create jobs, but is this just another unattainable grant program or smart marketing for Starbucks? We Do Need More Jobs! The unemployment rate in the United States has been hovering between eight and ten percent for quite some time now, and many folks in many states who have exceeded their unemployment benefits now have no money coming in at all. Even if Congress votes to extend such benefits, those who have exceeded their weekly benefit allocation may not be eligible based on how long they’ve been out of work. Visit almost any town (small, medium or large) and you’ll find closed shops, buildings for rent, homes in foreclosure, and uncompleted construction projects. American confidence is at an all-time low when it comes to who is going to ensure they’ll have money to put food on the table and a roof over their head. With all the fighting going on between the Democrats and the Republicans, the confidence scale seems to be drooping even further into a dark, dark place. Enter Starbucks! Well, sort of. Their solution was to join with the Opportunity Finance Network (OFN) to initiate the “Create Jobs for USA Program." 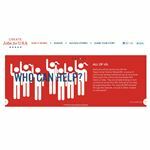 A $5 donations made at any of their 6,800+ locations garners you a neat red, white and blue bracelet with the words “indivisible" on it and a promise to create jobs via CDFIs—or community development financial institutions—with OFN overseeing the deals or grants that is. The goal is to use all of the donated money to fund new jobs or keep business owners from cutting jobs. While we do need jobs created and it seems like a great idea all around, in my opinion, after a little research, this “create jobs" program has its rules and regulations much like any other community development nonprofit grant offering. If your business doesn’t qualify and isn’t in the right location, the jobs created may only be funded in rural or depressed economies—not large metropolitan areas, which are also suffering. CNN Money’s Catherine Clifford posted a story on the Starbucks venture, “Get Your Starbucks, Create a Job" and wrote Starbucks’ CEO Howard Schultz said about the program, "This is not about marketing. This is not about Starbucks. This is about us saying to ourselves, we can't sit by and be a bystander any longer. It is about investing back into America." Well maybe, Mr. Schultz, but just how this money will be rewarded seems like a far-off “Neverland" dream to me. It’s simply going to be too hard to qualify for these grants and again, if your business doesn’t fall into what OFN calls a “distressed" or “depressed" area, you probably can’t even apply for any award. The idea is cool, the bracelet is well, rubber, and shelling out $5 for a donation doesn’t seem too much to ask from each American right? Surprisingly, in the Clifford story on CNN Money, she asked a handful of folks what they thought about the program and most hadn’t heard about it. Of the ones she did speak to, two were college students who said they probably would donate but Starbucks was not cheap coffee, meaning they’d have to make a conscious decision to visit a store when cheaper coffee options are available elsewhere. A business owner said he also liked the program but his donation (budget) funds were tapped for the year. There are three entities in this challenge to create jobs. Starbucks, OFN and CDFIs—the last two have large qualifiers businesses must meet to tap into these grant dollars and whenever two or more organizations get together with a promise of gains for the better of all Americans, I can only think of two words: Red Tape! Let’s look at each entity and what they’ll gain or do in the Create Jobs program in the following sections. For the coffee giant, they say they want $5 donations from “employees, customers and concerned Americans" and are happy to accept those donations at their store locations. I’m more of a tea drinker myself, but if I were a coffee drinker and I liked Starbucks, I could visit one of their stores, pay more than I wanted to for a café latte, and then hand over another $5 bucks to the create jobs program. So, Starbucks is gaining customers and has found a brilliant way to keep customers coming into their store—good for them! This is true and not true. You don’t have to actually go to a Starbucks location to donate to the program. 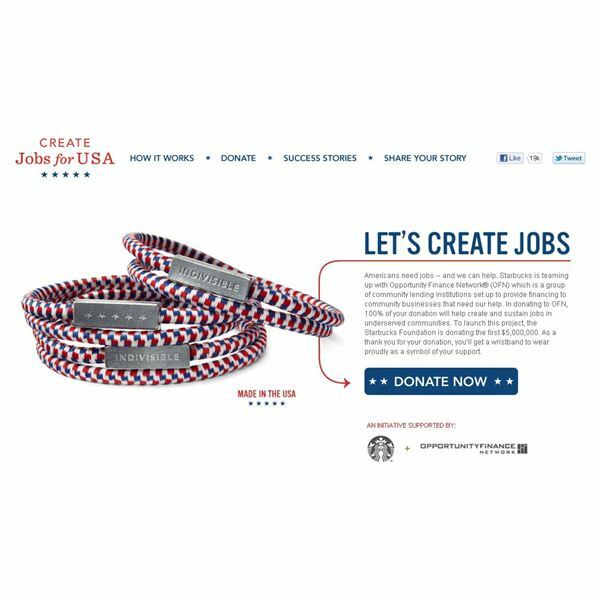 The Create Jobs for USA website (link in reference section) offers a place where all of us “concerned Americans" can donate our $5 (or as much as you want) and get a bracelet sent to you. If this sounds like something you want to support and don’t want coffee at Starbucks’ prices, use the website and skip the store. In the end, however, I still think Starbucks wins on customers and the “How awesome is this American company" scale. “Opportunity Finance Network (OFN) is pleased to partner with Starbucks on the Create Jobs for USA Fund, a new initiative that creates and sustains jobs across the U.S. by providing grants to community development financial institutions (CDFIs) that lend to Community Businesses." The above statement is on the landing page and one must maneuver through many pages to find out how OFN plans to offer the free awards. There’s an FAQ page, a How to Apply page, and the all-important, OFN Membership page. Yep—you have to be an OFN member—or your local CDFI does, in order to be considered for the funds donated during this two-year partnership. “If you are interested in becoming a Member please review OFN's Membership Principles, Eligibility Criteria, and Performance Expectations before applying to become an OFN Member. For additional information, please download OFN’s Membership Guidelines. 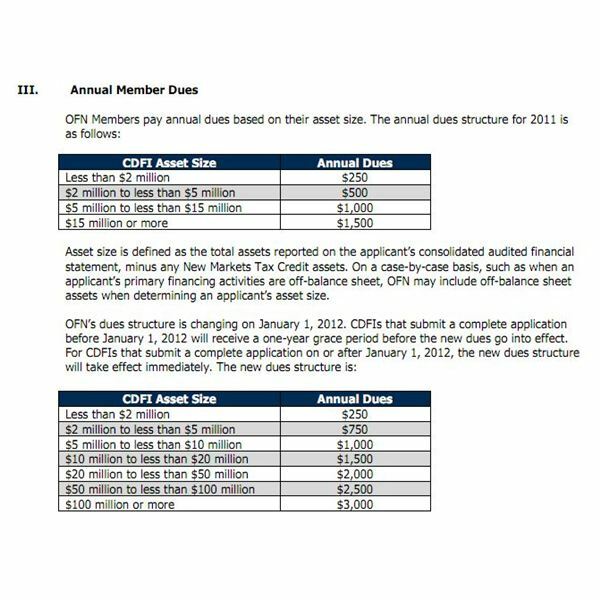 This document describes OFN’s Membership Principles, the method we use to evaluate a CDFI’s alignment with these principles, the Annual Review process, and Membership dues." Right away, I got frustrated with the “membership dues." If your CDFI “qualifies," the screenshot to the upper left shows how much your annual membership dues actually are, and they range from $250 to $3,000 depending on asset size and asset size means investments. So, OFN is also gaining here, at least on the dues part. If you take the time to download the “practice application," which I found insulting (am I that dumb that I need to practice) you too can learn how many stips and regulations your CDFI must meet in order to be an OFN member—again, Red Tape! Finally, we must take a look at the last part of this venture, which is Community Development Financial Institutions or CDFIs. If you don’t know what one is, do a Google search with your town’s name and “economic development center" (Austin Community Development Center, for example.) Almost every town, both large and small, has one of these development centers. 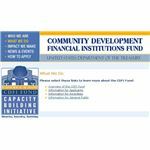 A nonprofit community fund can be also certified as a CDFI or a credit union. 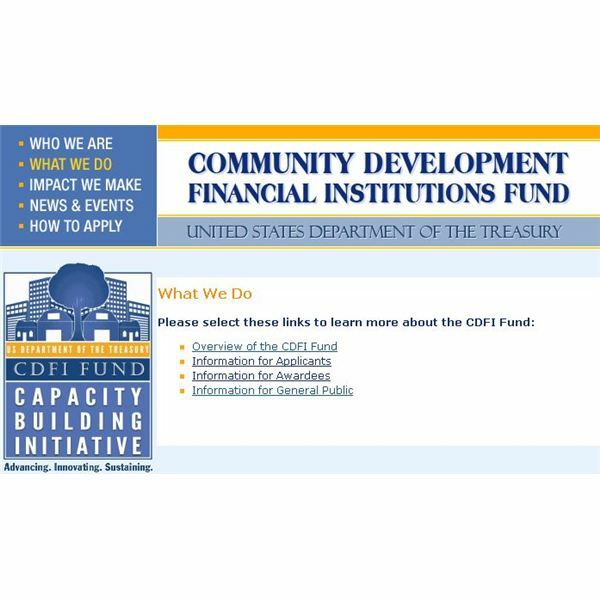 Next, one must maneuver on the website to how to become certified as a CDFI and to do this; you must visit the United States Treasury’s CDFI Fund website. There’s a 21 page IRS-like application that offers mostly disclaimers, or what I like to call reasons you won’t qualify, but basically, your CDFI must be a “domestic corporation or partnership" that is an “intermediary vehicle" offering loans (or grants) in low-income communities and must be able to provide regular reporting and audits to the U.S. Treasury or in our Create Jobs USA program, audits and reporting to OFN. The application is long, tedious and because of its IRS-ish nature, I wondered how many of these organizations would initially qualify and then be disqualified because there’s an entire section on “accountability" and that’s a whole new web page! No money is made here at the U.S. Treasury, and OFN promises if you’re an OFN member and you are audited, it’s at no cost to you so I guess the CDFI is basically the last leg in the race, or the organization handing out the loans isn’t gaining much, except maybe some grant processing fees, or who knows what other fees will pop up as this program is in its infancy. The Starbucks Create Jobs USA program does sound complicated and remember, if your CDFI isn’t in a low-income community, forget about applying for any Starbucks donated dollars. OPN wants you to join no matter what, however, and pay your dues because you just never, ever know if your community will suddenly be qualified as “low-income." OFN says most awards will be in the $500,000 dollar range; however, there are some stips to that too. 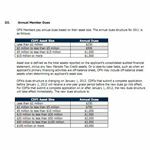 If your CDFI funds 25% or less into the community, you probably won’t get any Starbucks money as these awards are made on a case-by-case basis, which when translated means—you don’t qualify. In addition, there is that teeny, tiny requirement of the entire program, “distressed and depressed." What community isn’t right? On the other hand, your community may not be as distressed and depressed as you think it is, even if Intel just closed down or an automaker recently closed up shop. It’s all up to meeting or exceeding the criteria, and if a CDFI doesn’t qualify, no matter how many cups of Joe you purchase and how many $5 bucks you donate, don’t expect a grant for your business to create a job or use the funds to keep people employed because it’s not going to happen. Like other grant programs, I’m sure the business applying to their local CDFIs will also have to qualify. Is the business trustworthy, profitable and does it have good cash flow management? Of course it doesn’t, that’s why it needs money from Starbucks, and it’s not going to get money if it couldn’t seem to manage the cash it initially had. No CDFI is going to invest in a business that is failing or on its way out—that’s the truth plain and simple—and if you’ve ever applied for an SBA loan or even a regular bank loan to help fund your business, you know the process is as invasive as a pesky paper cut! I’d like to think this program will work, but it’s too early to tell. I'd like to monitor it and update this piece so check back as awards will be reviewed in late December and then the CDFI who wins them can dish ‘em out to those who meet their qualifications. I’ll also report on who is winning when it comes to awards. I’d like to report on the losers who have applied for funds but I’m not sure that data will be available. Well maybe some grouchy CDFI will write a blog post once denied—we all must wait and see! What do you think? Is this a good idea and will it work? Alternatively, is it just another scheme by Starbucks to get people to buy more cups of coffee? I really don’t need a wristband that is red, white and blue and says “indivisible" on it so I’ll probably skip donating $5 to the cause, but don’t let that stop you if indeed you think the real victories will be seen on the unemployment lines. Clifford, Catherine, CNN Money – “Get Your Starbucks, Create a Job" November 2 2011.